Now you can choose between Logitech's two mechanical-key switch options. Four years. I’ve spent nearly four years poking fun at Logitech’s Romer-G keyboard switch, ever since its debut in the G910. “Mushy,” I said way back in ye olden days of 2014, and while the original Romer-G switch has gone on to have a bit of a following, I still haven’t changed my mind. I hate it. But I can finally start using Logitech’s keyboards again. 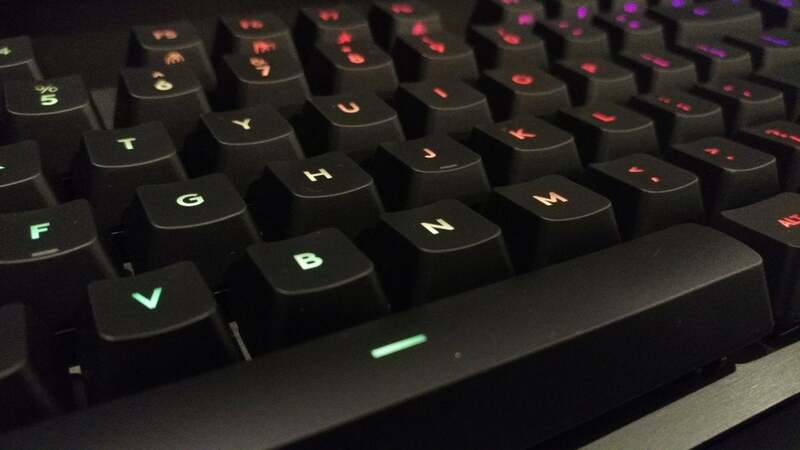 Logitech recently debuted the G513 keyboard, and along with it, a second Romer-G switch. This one eschews the clunky tactile bump of the original in favor of a more straightforward linear keypress. Before we delve deeper into the Romer-G Linear switch, let’s first talk about the keyboard that houses it. The G513 is another entry in Logitech’s current lineup of minimalist—some might say “professional”—gaming keyboards. Or...well, technically, it’s a duplicate entry. As far as I can tell, the G513 is pretty much the exact same keyboard as Logitech’s existing G413. If that’s not ringing any bells, I can sum it up for you: Black rectangle. Of course, it’s not really black—more of a carbon-fiber gray color. You get the idea, though. Even with its raised keys and exposed backplate, the G413 is one of the most restrained designs in a Logitech portfolio that (at this point) is full of them. The G513 follows suit. With one key difference: A wrist rest. 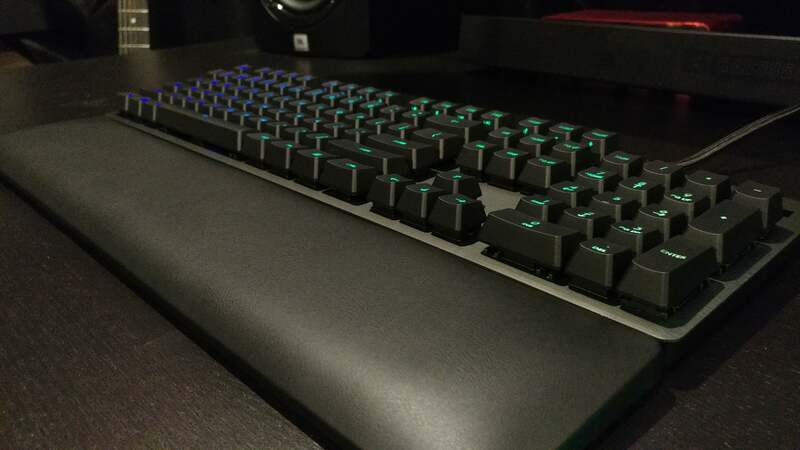 Last year in my review of the Razer BlackWidow Chroma V2, I made special note of its wrist rest. Generously padded with almost an inch of foam, it was one of the most comfortable pack-in wrist rests I’d ever used, attached to the keyboard by way of a fancy magnetic connection. The G513 now boasts a similar wrist rest. Coincidence? My guess is not. But either way, this is a great trend, in my opinion. 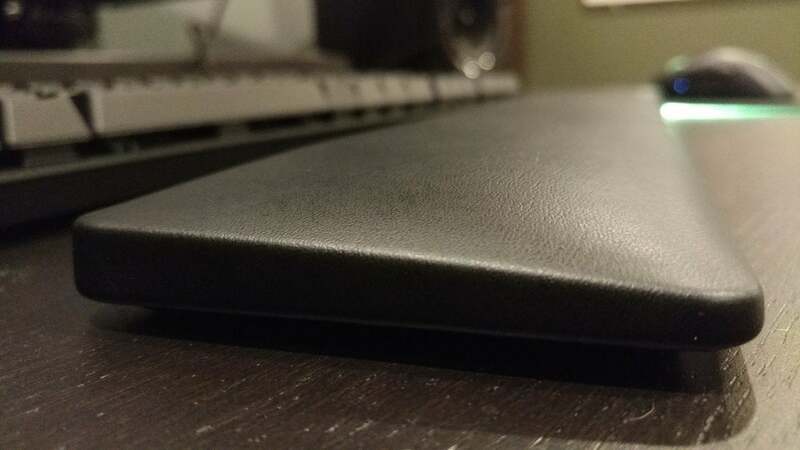 The G513’s wrist rest is large, comfortable, and slightly more ergonomic than Razer’s—there’s a subtle slope to it, and it’s padded all the way to the edges instead of being framed by plastic. Ultimately, it’s one of those rare features I hope makes it over to the rest of Logitech’s lineup. It also helps mitigate the $60 price difference between the G413 and G513. The only real disappointment here is the lack of dedicated media keys. Given the fact that even Logitech’s bargain-priced G213 Prodigy keyboard has a volume rocker and suite of media controls, I expected the G513 to sport something. Anything. Alas, here you’ll have to rely on double-mapped Function keys. Not the worst thing in the world, but once you’ve used dedicated media keys for a while (and I have) it’s hard to go back. Anyway, enough about the keyboard design. 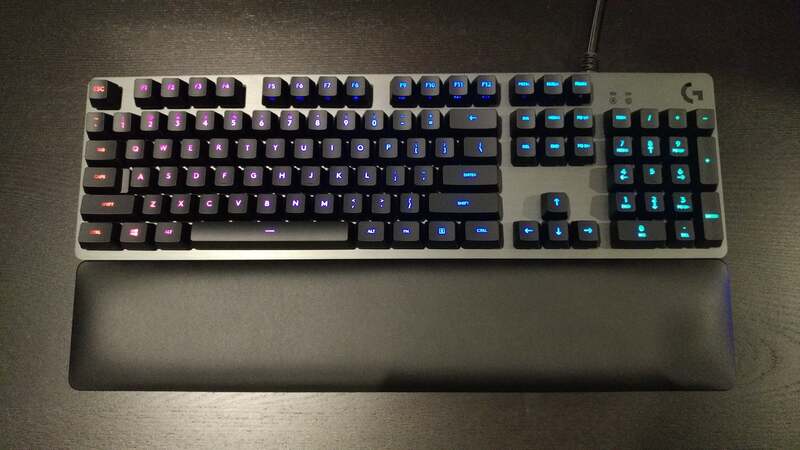 It’s attractive, it’s functional, it hits all the same notes that Logitech’s been hitting for the past few years—ever since the G610/G810 at least. But it’s been a long time since I’ve voluntarily kept a Logitech keyboard on my desk, and the reason is Romer-G. As I said, I hated Logitech’s proprietary switch. Modeled after the “tactile bump” of Cherry MX Browns, I nevertheless found Romer-Gs unpleasant to type on, even going so far as to compare them to the loathed rubber domes most mechanical keyboard lovers are trying to escape from. And finally, Logitech has. The G513 is the first keyboard to ship with two different options: Romer-G Tactile, which is the original switch, and the new Romer-G Linear. I’ve had the latter on my desk for a few weeks now and...well, that’s all I really have to say. I kept it on my desk, for weeks. Linear switches still aren’t my favorite—I’ll take a clicky Cherry MX Blue over Red or Black any day. But if I’m going to use a Romer-G board, this is the switch I’m going to use. With an average 45 grams of force and a 1.5 millimeter actuation point, the Romer-G Linear switch mimics the popular Cherry MX Red to a large degree. They’re not entirely similar, with Romer-G Linears having a shallower actuation (Reds are at 2 millimeters) and a shorter travel, but it’s close enough for most people. More important, the Romer-G Linear feels crisp and clean like a mechanical switch should. Keypresses are smooth, with none of the mushiness of the old Romer-G. It took four years, but apparently it was four years well-spent. My only complaint is a bit of a metallic ping sound when I hit a key too hard, but I think that’s probably due to the G513’s exposed backplate and not the switch design. It’s also worth mentioning that Romer-G Linear accomplishes this without changing the fundamental design of the switch. 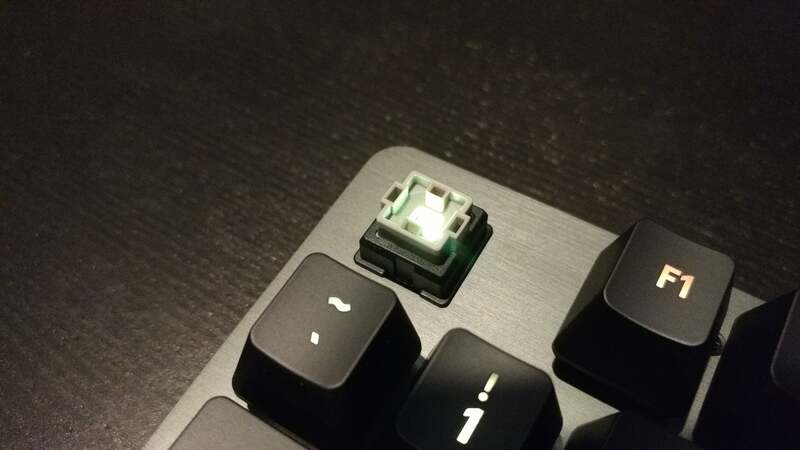 That means if you pry a keycap off you’ll see the same footprint as the Romer-G Tactile: a center-inset LED with a square of plastic around it, secured by four prongs. For the end-user, that means bright and evenly dispersed LED backlighting. That’s Romer-G’s main selling point in my opinion. 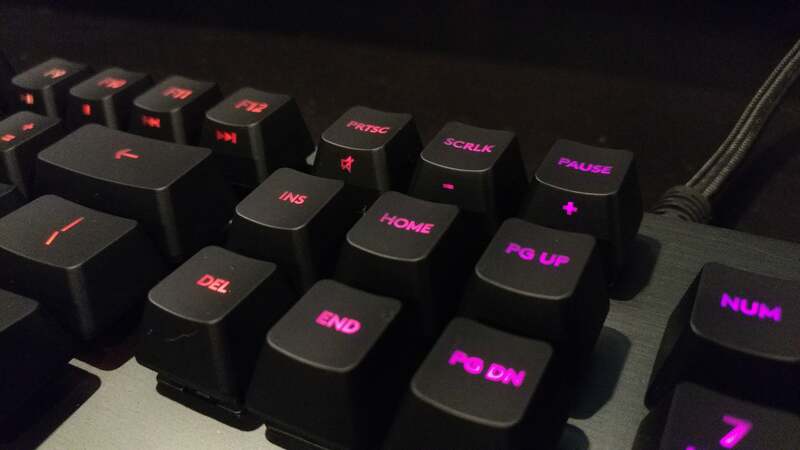 The Cherry MX “stem” design (also used by Cherry knockoffs like Razer’s switches) places the LED above the switch, which means the lighting is concentrated at the top of each key—and indeed, Cherry MX keyboards compensate for this by shifting all lettering upwards. It works, but looks a bit weird and also leaves secondary functions (i.e. the symbols in the number row) unlit. Romer-G doesn’t have this problem. Since the LED is centered you get lighting across the entire key, including both primary and secondary functions. They can even light the side of keys, and do so here to great effect—all of the media keys are actually labeled (and backlit) on the facing edge. It’s a cool design, and one only Logitech can pull off at the moment. Would I reach for a Romer-G keyboard first? Probably not. Romer-G Linear hasn’t suddenly leapfrogged to the top of my charts. But it’s a damn good step for Logitech. I’ve spent four years praising Logitech’s keyboard designs (except the short-lived G410) but not using them. Romer-G Linear finally gives me an option I’m comfortable keeping on my desk. It’s also surprisingly quiet for a mechanical keyboard switch—something office workers might be interested in. As for the G513 it’s housed in? That’s excellent too, combining Logitech’s recent minimalist design aesthetic with a trendy exposed metal backplate and—don’t forget!—one hell of a comfy wrist rest. Finally, those who want a full Logitech setup don’t need to settle for a second-class switch. Logitech's G513 is more than an attractive, professional-looking keyboard. It's also the debut of Logitech's new Romer-G Linear switch, a Cherry MX Red-like switch that finally gives Logitech lovers some options.